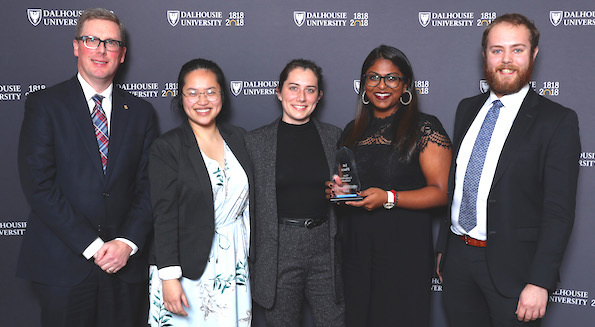 Students from across Canada participated in the 2018 Scotiabank Ethics in Action Case Competition at Dalhousie November 23 and 24, which saw the John Molson School of Business from Concordia win at the undergraduate level and the Rowe School of Business win at the graduate level. Students made two separate presentations to top-notch judges from the academic and business community on cases exploring an ethical business dilemma. For Friday's session, students had 10 days of deep case analysis and preparation. On Saturday, students were given only three hours and no resources before presenting their solution. Competition was stiffer than ever, with 14 teams competing from as far away as Victoria, BC. 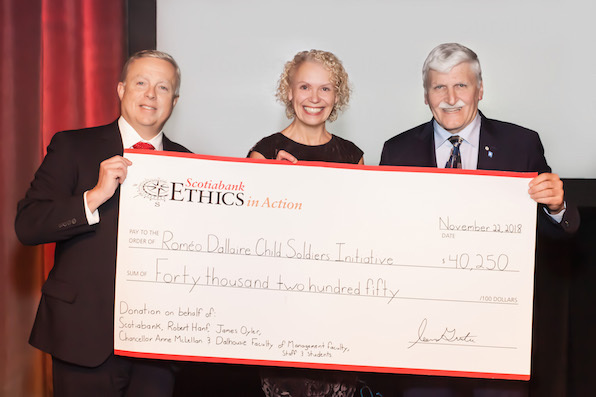 At the opening gala on November 22, attended by over 250 students, military personnel and community members, Scotiabank presented the 6th Annual Scotiabank Ethical Leadership Award to Lieutenant-General (Ret’d) The Honorable Roméo A. Dallaire, who founded the Roméo Dallaire Child Soldiers Initiative, based at Dalhousie. To end the evening, Faculty of Management Acting Dean Vivian Howard announced a donation of $40,250 on behalf of Scotiabank, Robert Hanf, James Oyler, Dalhousie Chancellor Anne McLellan, Larry and Myra Freeman, and Dalhousie Faculty of Management faculty, staff and students to further the work of the Child Soldiers Institute. 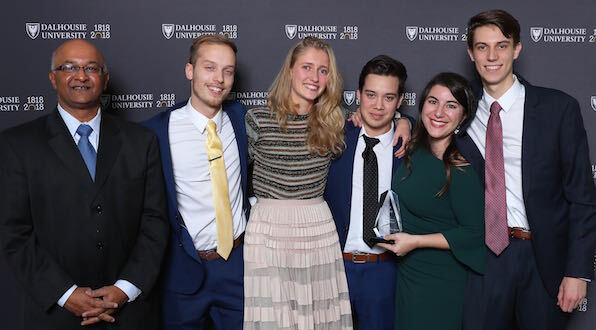 Dalhousie’s Faculty of Management established Ethics in Action in 2013 with a $1.5 million donation from Scotiabank. The student-led program is aimed at engaging business students and the Canadian business community in shaping ethical business leadership. The Scotiabank Ethical Leadership Award recognizes ethical leaders from across Canada who, through their actions and decisions, have demonstrated character, courage and adherence to ethical principles. Leaders from any sector, including public, private or not-for-profit, are eligible to be nominated. The winners serve as an inspiration to other practitioners and to today’s students. Past recipients are Sir Graham Day/Phil Fontaine (joint), Richard Pound, Irwin Cotler, Anna Tudela and the Honourable Justice Rosalie Silberman Abella. "There's no textbook about this level of interdisciplinary engagement"